Kai Rostcheck is the founder of Tiny House Lending, Tiny House Dating and I Love Tiny Houses as well as a co-Producer for the documentary Living Tiny…Legally! 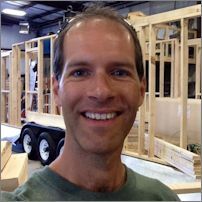 His articles about the Tiny House Movement have been published in Tiny House Magazine and on Boston.com, he appeared on WCVB-TV’s “Chronicle” about the Tiny House Movement in Massachusetts and he has been interviewed for numerous Tiny House blogs. In everything he does, Kai evangelizes the belief that Turning Tiny represents a viable, conscious choice based on personal values and shifting socioeconomics.